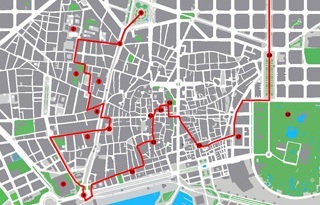 This itinerary is very linked with Roman Theme Barcelona because a lot of buildings have been constructed above the ground of some former roman architectures so don’t be surprised if you go to the same place twice. My only advice is that you skip the section you already did. I divided this itinerary in 3 days in spite that majority of places are located in the same district which is the Ciutat Vella. I did it because there are some sites that you have to go during a special time schedule. Before to start and because I don’t know where I can put it, let me introduce you the catalan shield that you can see on majority of the government building. It is the symbol of the Autonomous Region of Catalonia and it didn’t appear before the 15th century although the catalan flag (señera de Cataluña in catalan) was used during the Aragón Crown period only by the king. The symbol is 4 red sticks on a golden background (like the flag) with the crown above. The 4 red sticks represent the 4 regions which composed the Aragon Crown and which were Barcelona, Mallorca, Valencia and Sicilia. 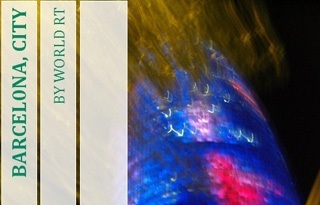 Actually, in Barcelona, you may also see a version with a red cross which symbolizes the cross of Saint George. After this quick introduction, let´s start the first day by the Gòtic neighborhood. 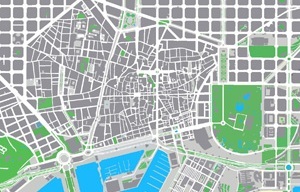 Assuming that you are in “plaza catalunya”, this section is on the left side by walking down la rambla street. 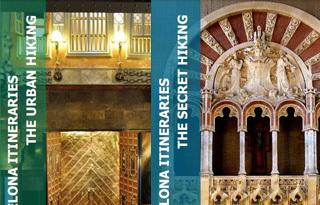 Your first stop will be the Santa Maria del Pi church (plaza del pi 7). It has been built between 1319 and 1391 of a purest gothic style on the ground of the former roman church and by going near the Ave María doorway, you will see some ruins. Unfortunately, after the spanish civil war, the original windows have been destroyed and Josep Maria Jujol has been asked to restore them. Leaving this place, you will head at the seu square. Originally, there was a 4th century early christian basilica which was destroyed by the Al-Mansur armies. Nowadays, the Santa Creu Cathedral (plaza de la seu), also known as Cathedral of Barcelona, has been built on the former roman cathedral and its construction started from 1298 to 1913 but the main section finished in 1460. In spite that the gothic facade finished in 1889 and the last part, the central spire in 1913, the original design from Charles Galters, dating from 1408, has been kept to complete the work. the pulpit and the crypt where the body of Santa Eulàlia rests in peace. the Palau Reial Major (Great Royal Palace) dates from 11th century but redesigned during the 13th century. Built on the bases of visigothic and roman architectures, the place was the residence of the catalan counts from the 13th century until the beginning of the 15th century. At the sant jaume square, you will find the City Hall, also called City House, and the Palace of the Catalan Government. Due to its special visitor opening of both places, it may be best to start this Medieval Theme Barcelona first here instead of the Santa Maria del Pi church but only if you plan to enter. the hall of 100 (saló de cent) built by Pere Llobet during the 14th century. Its name comes from the period of the first catalan government (1373-1714) named Council of 100 (Consell de Cent) where its members reunited in this gothic hall. the hall of chronicle (saló de cròniques) decorated with paintings by Josep Maria Sert (1928). the hallway and the gothic stairway decorated with sculptures by Gargallo, Llimona, Navarro Subirachs, Marès, Miró and Clarà. On the main front of the building, you can distinguish 2 statues, the king Jaume I (the founder of the Council of 100) and Joan Fiveller (counselor of the Council of 100), which are the work of Josep Bover (1847). And by looking towards the ceiling of the tourist information office, located on the ground floor inside the City Hall, you will see “the four seasons” painted by Albert Ràfols Casamada in 1982.
or arranged visit by calling (+34) 934024600, only saturday and sunday from 10h-13h and 16h30-19h. the gothic cloister with the stairway and the chapel on the first floor made by Marc Safont. the renaissance orange courtyard which was built between 1532 and 1547.
the renaissance main hall also known as Saint George hall. the Torres García hall where you will see some paintings of this artist. The next stop will be at the ramón berenguer el gran square, behind the statue of the catalan count, you will spot the gothic royal chapel of Santa Ágata. The statue is the work of Josep Llimona to commemorate Ramón Berenguer, count of Barcelona, between 1096 and 1131. It was in the 14th century, during the reign of Pere III, that the chapel has been built as part of the royal palace. By entering, you will discover a fabulous gothic work from Jaume Huguet. Walking on the street, you will go to the montcada street which was the main and most aristocratic street so walking on it, you will discover a lot of medieval, renaissance and baroque palaces. Take note that if you plan to enter in the museums, this itinerary will take more than 3 days except if you will do it quickly but I don’t think so, specially the Picasso museum. The Santa Maria del Mar basilica (plaza santa maria 1), also known as Ribera cathedral, is a beautiful catalan gothic architecture built from 1329 to 1384 by Berenguer de Montagut. Inside, you will discover a structure of 3 naves with high columns and impressive windows like the Ascensión one in the Santa María chapel, Lavatorio one in the San Rafael chapel… In the past, this place was the temple of shipowners and merchants and in 1428, due to an earthquake, some parts, as the great rose window, have been destroyed and rebuilt in the middle of the 15th century so if you look at the floor, you may see some tombs from particulars, guilds and brotherhoods of the middle ages period. Before leaving this place, take in mind that Gaudí was inspired by its beauty to design his Sagrada Familia. At passeig Isabel II nº 1, you will find the Llotja house with a neoclassical facade. Built in the 14th century, it was extended one century later and rebuilt during the 18th century. Originally it was used as a meeting and trading place by merchants and actually, it is the headquarter of the Chamber of Commerce. In 1775, the father of Pablo Picasso taught in this place and himself as student because it was the Royal Academy of Arts. To discover some medieval works, you will have to go inside to see the beautiful trading and consul halls but also some neoclassic sculptures as the Dying Lucretia. This is the end of the first day and the 2nd day will start with the other side of la rambla street so instead to turn left, you will have to turn right but not before to spot the number 79-81. In 1929, it was declared as Artistic Historic Monument of National Interest after to have transferred it to its new site, the hospital of Santa Creu i de Sant Pau (sant antoni maria claret 167). Looking for the Guifré II Borrell (897-911) tombstone, you will have to go to the small Sant Pau church (sant pau 101) which includes the ancient benedictine convent, Sant Pau del Camp. Located in the old convent neighborhood, actually known as Raval, the place still keeps the original octagonal bell tower partially destroyed in spite to the numerous attacks and reconstructions of the past. You should visit the marvelous cloister of polylobulated arches and if you take a careful look on the decoration, you should discern a picture of Adam and Eve near to the tree with the snake and a woman tormented by 2 toads devouring her breasts. Going down the street and near the Christophe Colomb statue, you will discover the Royal Shipyard building (avinguda drassanes 1). It was during the 13th century that it was built and its main goal was the construction of the galleys for the Aragón Crown but the original design didn’t include a roof. 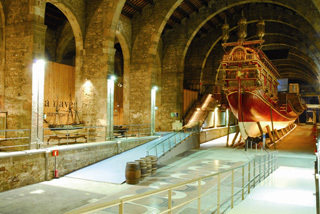 It was only a wide walled rectangular building with 4 towers (one in each corner) and in 1328, it was decided to build the roof because majority of the ships were damaged due to the weather and since 1941, the place is the Maritime Museum where you still can see only 2 of the original towers. It has been declared as Artistic Historic Monument of National Interest in 1976. This is almost the end and for the last day, you will have to leave the Ciutat Vella district to go to Les Corts district but before, you will start the day at the same district by visiting the Sant Pere de les Puelles church (lluís el piadós 1). Originally, it was the first benedictine nun convent in which majority of its members was aristocrat daughters in 945. Located outside of the city wall, it has suffered a lot of facts like the attacks of the arab armies. In 1873, it has been changed in parish church and in 1879, it has been decided to move the nuns to her new convent at Sarrià neighborhood, exactly at “c/ anglí 55”. After suffering many fires and reconstructions, it has been restored in 1945 for the last time after its last fire during the civil war so very few things remains from the old period like one of the 2 octagonal bell towers. To visit it, you have the choice between tuesday and/or thursday from 18h30-20h30. Now, you will have to take the bus 22 or 68 from plaza catalunya to bisbe català stop to visit a monastery. Unfortunately, there is no metro station near to it. If you want to see more medieval works, I recommend you to go to the MNAC (National Art Museum of Catalonia - mirador palau nacional 6-10) located at Montjuïc. To get there from the monastery, take the bus 64 from plaza pedralbes to plaza universitat stop and after take the bus 9, 50 or 56 to plaza espanya stop or the metro L1 to espanya station. 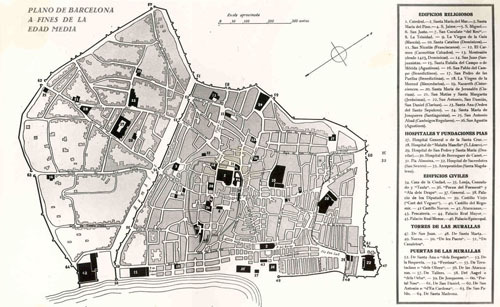 You can also take a look on the archeological map to see where there are the ruins.